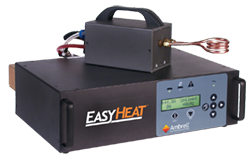 Ambrell, a leading manufacturer of induction heating systems, has sold an EASYHEAT 4.2 kW/150-400 kHz induction heating system for a catheter tipping application in the medical industry. The process involves heating an aluminum catheter tipping die to 500 °F (260 °C) and then pressing the polyurethane tube into the mold. A wire is used during the process to prevent collapsing of the tube. Catheter tipping is just one of many applications that Ambrell has experience with in the medical industry. Others include nanoparticle heating, soldering and bonding of medical tools, hardening of medical blades, and a variety of general research applications within universities. Visit our website to learn more about catheter tipping with induction heating and to read a selection of related application notes.